“When the man saw that he did not prevail against Jacob, he touched his hip socket, and Jacob’s hip was put out of joint as he wrestled with him” (Gen. 32:25). The Jacob who wrestles with the Lord on the banks of the river is very different from the Jacob who, by trusting himself, gained the blessing of Esau (Gen. 25:29–34). After his years as Laban’s slave, Jacob has increasingly seen the impotence of his efforts apart from God’s blessing (31:4–16). 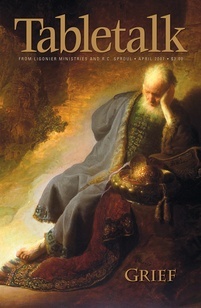 However, his attempt to buy Esau’s forgiveness (32:1–21) shows Jacob does not yet understand that he must rely on God alone. In today’s passage, he learns his lesson the hard way. The Lord purposely tangles with Jacob in the night (vv. 22, 24, 26). Isaac’s son is no fool; if Yahweh were to come in the daylight, Jacob would not have struggled with Him because his divine foe’s strength would be visible to the eye. By day, Isaac’s son would rely on his own smarts and avoid a conflict he was sure to lose. Thus, he might again be confident that his own strength could save him. But since the Lord came at night when Jacob could not see Him, God gets him to do the “sensible” thing (from man’s perspective) and fight back. The Lord withholds His full might for a time to let Jacob think he is winning. But just when the patriarch thinks he has the upper hand, God puts his hip out of joint (v. 25). The Almighty did not tear Jacob’s leg from its socket, as the Hebrew indicates he was wounded by a soft touch. Jacob clings to the Lord and begs Him for a blessing (v. 26), as the force of this nudge begins to reveal the identity of this “man.” After all, only God has the strength to crush with a delicate tap. For too long, Jacob has assumed his skill is the primary factor in his success. In defeating the patriarch so easily, the Lord shows Jacob who has the power and who truly holds the key to his future. By implication, the wounding also teaches Jacob that he was really fighting against the Lord’s holy character when he used dishonest tactics to secure Esau’s birthright, even if the blessing was rightfully his. Today, the Lord still wounds His people. Perhaps, like Paul, He will give us a thorn to display His power in our weakness (2 Cor. 12:7–10). Maybe God will use the stripes of men to discipline us like He did with David’s sons (2 Sam. 7:14). Whatever the case, the Lord will not hesitate to wound us if it serves our good and His glory. Augustine reminds us that “the touch of the Lord is the hand of the Lord, chastising and giving life” (Works of St. Augustine, 31:223). Too many Christians today run after the abundant, life-giving touch of God without being willing to receive chastisement from Him. It is not popular to say that the Lord at times may discipline His children, but Scripture is clear that sometimes He tears us down in order to build us up (Hos. 6:1). And God is good even in His discipline.